An International Trade Union Confederation (ITUC) has slammed conditions faced by migrant workers building Abu Dhabi's $27-billion Saadiyat Island cultural hub, set to feature new branches of the Louvre and the Guggenheim museums. The trade union said on its website the world-renowned Guggenheim museum "has stepped foot in a region infamous for abuse" and had "failed to guarantee fundamental rights for its [migrant] workers" who "live a dozen or more to a room, work 15-hour days, and are beaten for striking." In an effort "to help unmask the abuse," the ITUC, which represents 176 million workers worldwide, has launched a petition, saying the viewing of modern art in UAE is being enabled "by modern-day slavery." “People are treated like battery hens. They’re locked in. There are guards. They leave at 5.30-6am, they go home at 6-7pm in the evening, or later if they are forced to work overtime, often unpaid,” the general secretary of the ITUC, Sharan Burrow, was quoted as saying by the Guardian. According to UN estimates, migrants make up over 80 percent of the UAE's population of about 8 million, with temporary workers (mostly from South Asia) making up the vast majority of private sector employees. Last month, a New York University (NYU) professor, known as an outspoken opponent of using underpaid and poorly treated migrant laborers in the Gulf, was prohibited from boarding a flight to Abu Dhabi to visit a branch campus of his own university, which opened there in 2010. In February, Human Rights Watch (HRW) released a new 82-page report on migrant worker abuses on Saadiyat Island. Though the government’s developers have never granted it access to the site, Human Rights Watch managed to speak to some 116 current and former employees of contractors on Saadiyat Island projects. UEA Interior Ministry representatives informed the researcher, as he was leaving Abu Dhabi in January 2014, they were blacklisting him and would bar his return. The report details how, five years after HRW revealed conditions of forced labor at the site, some employers are still "withholding workers’ wages and benefits, failing to reimburse them for recruiting fees, confiscating workers’ passports, and housing them in substandard accommodations." In the most serious cases, several hundred workers were arbitrarily deported after they went on strike. “They [the UAE authorities] arrested everyone they could get their hands on,” said a former BK Gulf worker (a contractor at the NYU site), who described the arrests, led by a group of masked police officers, as “terrifying.” Another worker said Dubai police slapped and pushed him in an interrogation, and demanded to know who had organized the strike, which the men said led to more than 200 deportations. Neither BK Gulf nor the Abu Dhabi Executive Affairs Authority responded to questions about the incident. “The progress in respecting workers’ rights on Saadiyat Island risks being tossed out the window if workers know they can’t protest when things go wrong, and are still getting stuck with recruitment fees and suffering other abuses,” Middle East and North Africa HRW director, Sarah Leah Whitson, said. “NYU, the Louvre, and the Guggenheim need to make clear that new laws and codes of conduct are only as good as their enforcement,” she added. PricewaterhouseCoopers, appointed by TDIC (a master developer of major tourism destinations in UAE) to monitor workers' welfare, issued the third in a series of compliance reports in December, confirming a number of the Human Rights Watch findings. PwC noted that TDIC had enforced financial penalties against only three of the six contractors it had sanctioned the previous year. PwC and TDIC neither named the sanctioned contractors, nor specified the reasons for the fines or the amounts. In response to Human Rights Watch, TDIC stated that without a random sample of workers, its findings did not “truly reflect the reality on the ground.” TDIC rejected the report’s "unfounded conclusions," which it said were "outdated and based on unknown methodologies." 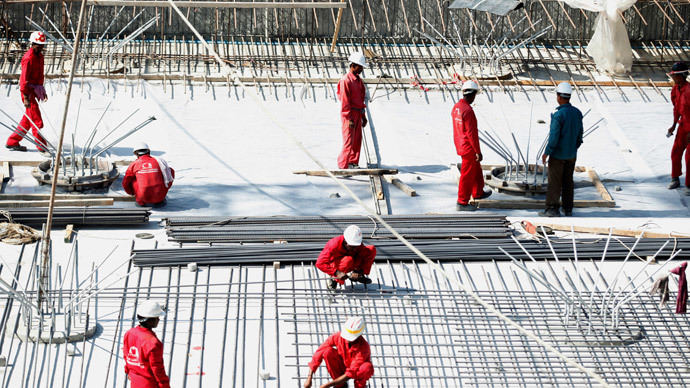 After calls by the ITUC to investigate evidence that migrant workers in the UAE are treated like slaves, the UN International Labor Organization has opened an investigation into the abuse of migrant workers, with findings due to be published by the end of the year. In its latest campaign targeting the Guggenheim and one of its major sponsors, Dior, the International Trade Union Confederation has urged action be taken against modern-day slavery. The ITUC compared Guggenheim’s "$75,000-per-table" fundraising dinner in New York last November, with what workers in Abu Dhabi are making "behind that glitz": $7 per day. "But human rights aren’t like perfume; you can’t mask abuse."